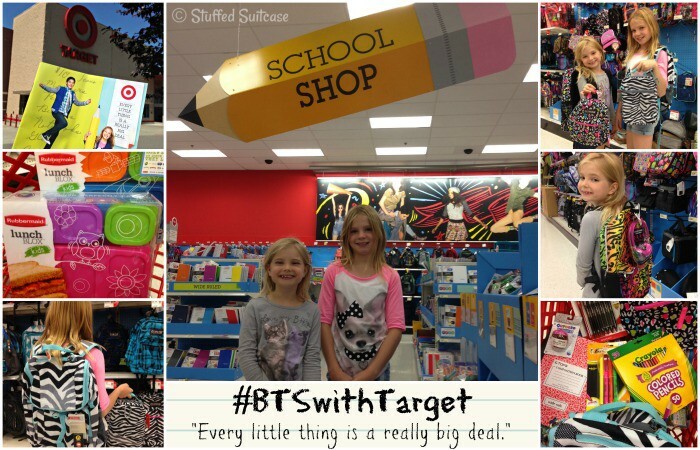 Recently we headed to our local Target, one of our favorite stores for style and prices, and started our back to school shopping early. Our girls start school on September 3rd, but it’s never too early for school supplies! We also had received a great back to school catalog from Target in the mail and the girls couldn’t wait to go check out all the backpacks and lunch boxes, while I couldn’t wait to lock in some of the great prices. Grace, my oldest daughter, was searching for something blue but also girly. She wanted to be sure to have a spot for her water bottle as her backpack last year didn’t have a side bottle pocket and she had some incidents where her water bottle leaked inside on her school work. Her other requirement was that she have a matching backpack and lunch box. She found just the perfect thing at Target with the Embark Jartop Zebra backpack and the Embark Crush Proof Zebra lunch box. Both were the perfect fit for her style and needs. My youngest, Faith, had her own idea on what she wanted for her school shopping list. She’s typically all about bright pinks and glitter. She was initially captivated by a bright rainbow animal print with matching headphones, however she eventually changed her selection when she spotted the cute mini Jansport backpack lunch box in bright cheetah print. The matching backpack was available and my bright, colorful, animal lover was joyous. We stocked up on most of our other required school supplies that were on our list. Grace was so happy that I let her splurge on the large 50 count Crayola colored pencils. Faith had fun choosing from all the folder options, settling on some purple prints, a cute kitty, and a ‘Girls Rule Boys Drool’ folder. Choosing scissors was especially fun since Target had so many options available, way more than I remember as a kid! It was then mommy time and I headed over to the food storage container aisle to find some new lunch containers to pack in those great new lunch boxes. I used the Rubbermaid LunchBlox systems last year and love how they help me build a balanced meal to send to school. The containers from last year are still in excellent shape, but I purchased another set for this year since one is always in the dishwasher. I’d love to know if you love school supply shopping or dread it? When do your kid(s) go back to school? I love those cute animal print backpacks and lunchboxes! We love Target too! My girls were so excited and love their finds! Thanks for visiting Annette! Is it that time of year already?!? Gah! didn’t summer just start? I know what you mean Bobbie! I feel like summer flies by way too fast!